The economic theory of Thomas Malthus isn’t what most people suffering a malaria delusion would dream about. But Alfred Russel Wallace, the sweaty patient in question, wasn’t a humdrum guy. Alfred Russel Wallace, an English naturalist, explorer and beetle collector, had been ruminating about how new species evolved. He was convinced that new species came from other, pre-existing species, but he could not identify the mechanism of such transitions. The question challenged him for years, and it took a near-death experience to shake it free from his subconscious. One night, soaked in sweat from a malarial fever (although some people speculate he had scrub typhus), Wallace recalled a passage from Thomas Malthus which explained why human population was kept under control. “I thought of his clear exposition of ‘the positive checks to increase’ — disease, accidents, war, and famine,” Wallace recalled in his autobiography. The next morning, nursed back to a bit of normalcy by his “faithful companion” Ali, Wallace wrote “From the effects of disease the most healthy escape; from enemies, the strongest, the swiftest, or the most cunning; …this self-acting process would necessarily improve the race…the fittest would survive.” [italics Wallace’s] He titled the document “On the Tendency of Varieties to Depart Indefinitely From the Original Type”, headed it “Ternate, February, 1858”, and sent the ten-page handwritten manuscript by Dutch steamer to Charles Darwin in England. Where exactly was Wallace when he wrote this famous paper? We know he mailed it from Ternate, (and it is always referred to as the “Ternate Letter” or the “Ternate Paper”) but his journal entries, which are in this case vague, indicate that he might have actually been on the neighboring island of Halmahera, where he could conceivably have written the first fever-inspired draft, later to transcribe a clean copy on return to his more comfortable base in Ternate. I start my search for Evolutionary Theory Ground Zero in Ternate, a spectacularly beautiful Manhattan-sized island with an smoldering conical volcano smack in the middle. 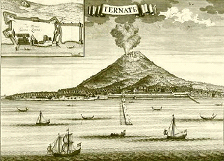 Ternate which was once the home of the entire world’s production of cloves and therefore the Eldorado of Arab, Chinese, Portuguese, Spanish, British (Sir Francis Drake bought six tons of cloves from the sultan here) and Dutch exploration. More specifically, I’m crawling around on the floor of a dilapidated house in this eastern Indonesia outpost, measuring tape in hand, trying to determine if this is where western philosophical thought took a major turn. I had come to visit what might be the site of Wallace’s Archimedes-in-his-bath-type breakthrough. The Sultan of Ternate claims that the house at No. 16 Jalan Sultan Hairun is the one in which Wallace stayed (or more realistically, located on the same site). The floor plan of the half-a-tennis court-sized house is roughly the same as the one Wallace sketched in his book The Malay Archipelago, and the location and details sort of fit: “a deep well…five minutes to the beach”. We ate mangoes from a very old tree, perhaps one of the “wilderness of fruit-trees” he mentions. The roof has collapsed and the residents are distant and poor relatives of the current sultan, the 48th of his line dating from 1257, one of the longest continuous royal families in the world. I gathered together the three barely-royal families that share this spare, possibly historic space. “Have you heard of evolution?” I ask. I asked several of the children at the house in Ternate if they had any idea why I was measuring the size of the black and white floor tiles in their home. Indonesians are too polite to criticize a visitor to his face, but I distinctly got the feeling that these boys and girls thought I was a ittle bit gila. Get ready for a media blitz in 2009 when the world will celebrate the 150th anniversary of the publication of Charles Darwin’s Origin of Species (and Darwin’s 200th birthday). This anniversary glitz will likely be similar to the visibility given in 2005 to the 100th anniversary of Einstein’s “Miracle Year”, during which Einstein published his special theory of relativity. In Origin, of course, Darwin outlines the theory of natural selection as the basis for evolution. But should much of the credit for this intellectual breakthrough go to Alfred Russel Wallace rather than Charles Darwin? Perhaps we should celebrate the birth of modern evolutionary thinking a year earlier, in 2008, which would be the 150th anniversary of what has come to be known as the Ternate Letter, written by Alfred Russel Wallace while in eastern Indonesia. While the older and much better established Darwin had undoubtedly been thinking about evolution and collecting voluminous data, up to that moment he had not published a single word on the subject. The rest of the story is lost in conjecture, conspiracy theory, scraps of letters and psychobiography. What might have happened is this: Darwin had been thinking about evolution for years, had compiled much data, but was missing the key, the mechanism, the bit about “the fittest shall survive”. Once he had that, thanks to Wallace, Darwin and his well-placed cronies in the British scientific establishment, basically claimed the idea as their own. Darwin of course became one of the most famous thinkers ever. Wallace became an (important) footnote in history. As enticing as it is to imagine Wallace sweating it out in Ternate, it is possible that Wallace might have been in Dodinga, a village on the New Jersey-sized neighboring island of Halmahera. Of course Wallace’s bamboo and thatch house in Dodinga is long gone. But based on his helpful notes written a century and a half ago, and on a very arbitrary decision on what felt right, I sat under a palm tree next to a stream, now an unpleasant gray and littered with instant noodle packs and cigarette boxes. The air smelled of mangoes, and five children giggled while playing tag. The nearby house had a satellite dish. Was it here that one of history’s most important scientific discoveries was made? Some kids were flying kites nearby. They looked over at me, curious, shy. I beckoned them to approach. “This is important ground,” I began.